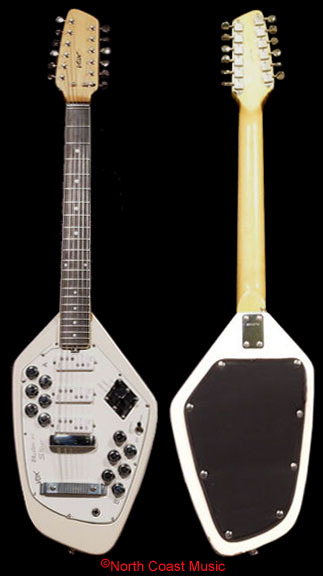 The Vox Phantom Stereo VI and XII were introduced in 1965 and were premium versions of the previously released V209 Vox Phantom VI six string and V221 Vox Phantom XII twelve string guitars. The V246 Phantom Stereo XII was offered in the 1966 "Vox: it's what's happening" catalog from the US distributor of Vox. Click on the catalog image if you are interested in purchasing a reprint of this 1966 Vox catalog. 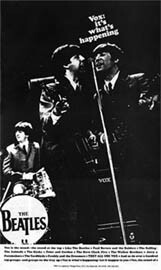 In addition to the Phantom Stereo, Vox also introduced the "Vox Phantom VI Special" and "Vox Phantom XII Special" guitars in 1965. The Phantom Special featured three "split coil" pickups. Each of the three pickups was divided into two circuits. The first circuit would provide the audio output for the three bass strings and the second circuit would offer a second and unique audio output for the three treble strings. Separate volume and tone controls were provided for each of the six pickup circuits, yielding an unprecedented twelve passive control knobs on the pick guard of the Phantom Stereo guitars. In addition, each pickup coil had a phase switch for further tonal control. A mono/stereo ouput switch was also provided. The Phantom Stereo VI and XII guitars were made for Vox by Eko in Italy. Their necks were equipped with Eko's proprietory "Double T bar" internal reinforcing channel plus an adjustable truss rod. The neck also included individual tuner keys and an aluminum nut.